Buy your tickets now for the Family Race Night organised by the PTA to be held in the school this Friday. There are a variety of fun activities organised. Tickets are available at the school office £3 an adult and £1 for a child. It’s bring your own bottle and snacks. First race 7.30pm and it finishes at 11pm. Looking forward to seeing as many people as possible there for a fun-filled night. Please note school lunches are now £2.10. Please ensure your child has sufficient funds to cover the cost of their lunch each week. 9.30 – Mrs. Elliott to attend Using SNSA Data to support improvement – Caldervale HS. Pr.4 – visit to church 1.30pm. Father Kane will join classes. Speech and Language therapist – liaison meeting with Mrs. Elder 2.30pm. What a talented bunch we have here at St Augustine’s ! Well done to all entries. Congratulations to our finalists. This week for our taught writing lesson we were discussing if children should wear school uniform. Some excellent arguments For and Against! We decided to have a little debate. 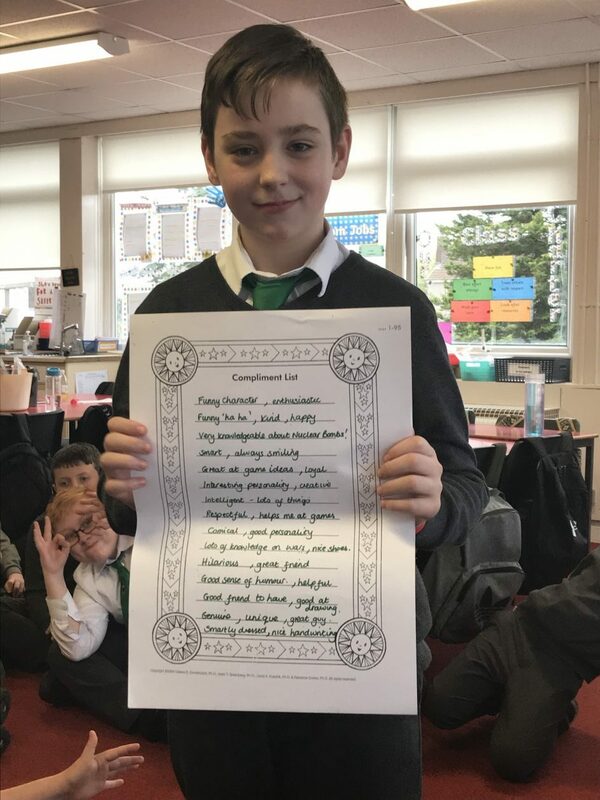 Being aware of your mental health is very important to the pupils of Primary 7 so we love giving compliments to each other to boost our self esteem. This young man was delighted with the compliments he received this week. Well done to these pupils who gained recognition from their teachers for their positive attitude to school. 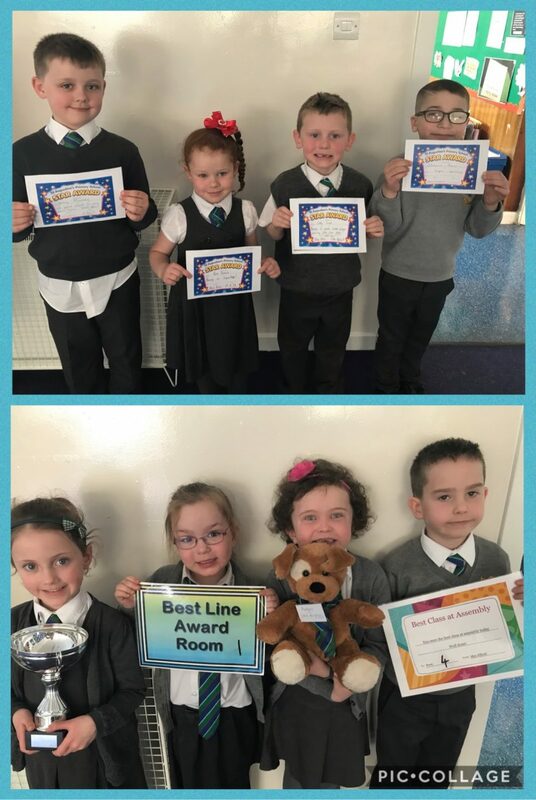 Congratulations to Room 1 for winning the Best Line Award and to Room 4 for earning Best Class. We were learning about the Stations of the Cross at our assembly today. Work is well underway on the Primary 7 yearbook and some great photos have been handed in to be included. To ensure everyone has a range of memories I would appeal for those who haven’t handed in their photos to please do so as soon as possible. Please do not go to any expense to print photos, Mrs Drummond provided her email address to the children today for electronic submissions. It is great to return to school after our Spring Break and to look forward to an action packed term with lots of dates to put in the diary. Please remember to check your child’s school bag everyday as the final newsletter for this school session will be issued this week. Please note the school wil be closed on Friday (Good Friday) and also on Monday ((Easter Monday).